Steve Jobs changed my life. It was a gradual process that began in the fall of 1984, when I first interacted with a Macintosh. I had moved into Castle Moose, a house full of game-playing Harvard graduates and later the location of some of my culinary milestones, including the legendary pumpkin pie story. In addition to my three housemates, another friend, Andy Greenberg, was couch surfing while he worked on various computer game projects. Andy was one of the authors of the Wizardry series of role-playing games, and had been asked by Steve Jobs to port the game from the Apple II to the new Macintosh. 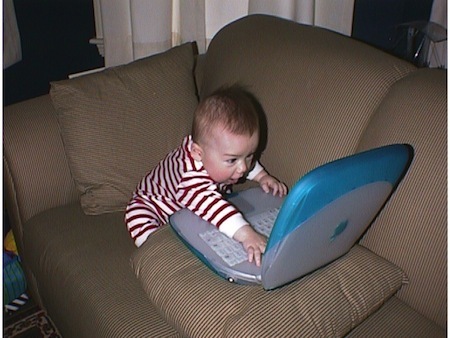 Having games available for the new machine was a key selling point, so Jobs sent Andy one of the first Macs to come off the production line. It sat on a table in our gaming room, where Andy worked away at it at all hours. Soon after I moved in, I found myself alone in the house for a day, which gave me an opportunity to check out the new machine. I powered it up and stared at the screen, which was displaying a blinking floppy disk icon. The disk labeled “System,” sitting in a box next to the Mac, seemed to be the most likely candidate, and a minute or two later I was mousing and clicking around on the desktop. I discovered the MacPaint and MacDraw program disks, and by the end of the day I was hooked. I was no stranger to computers. I was from an IBM family: my father programmed System 360 and 370 mainframes (in assembly language) and my mother worked at corporate headquarters in Armonk, NY. She had used her employee discount to buy me the PCjr that sat in my bedroom, but those first few hours with the Mac revealed the IBM box to be a ugly, clunky, underpowered, inflexible hunk of plastic and metal. Almost every lab I worked in had at least one Apple II for data collection and analysis (usually running Visicalc), but they had green-on-black low-resolution displays – the Mac had fonts. My interest in design and typography began with the Mac. I worked in biotech, but I knew I would only advance so far before hitting the PhD glass ceiling. I soon became “the computer guy,” which is when I learned that I was ideally unsuited for tech support positions – I couldn’t comprehend how anyone could have a problem with the Mac’s interface and ease of use. Between tech jobs one summer, I attended a Macworld Expo and convinced the booth monkey at MacTemps that I had page layout and illustration skills. I bought software how-to books and was able to bluff my way though the first few jobs, teaching myself Pagemaker and Freehand in the process. A job editing chemistry illustrations turned into a full-time position at McGraw-Hill, which led to my working for a multimedia developer. 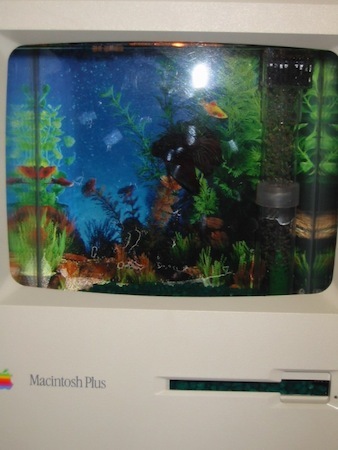 Although I worked with Macs every day, I wasn’t able to afford one of my own. I had a hand-me-down IIci that She Who Must Be Obeyed had rescued from Polaroid, but we finally saved up enough to buy a 7100, a machine that I still use to recover files from friends’ antiquated storage media (floppies, SyQuest cartridges, Zip disks). Our next Mac, an original turquoise clamshell iBook, arrived shortly after He Who Will Not Be Ignored. He Who has no concept of a life without computers. And then there are the gadgets, the non-tradtitional computing devices that I can’t imagine living without. That’s a limited edition Newton, which She Who used for two years until she replaced it with a Palm Pilot. I paid $500 for the 10 GB first-generation iPod and recently spent half that amount for a smaller, faster version that holds 160 GB of music. 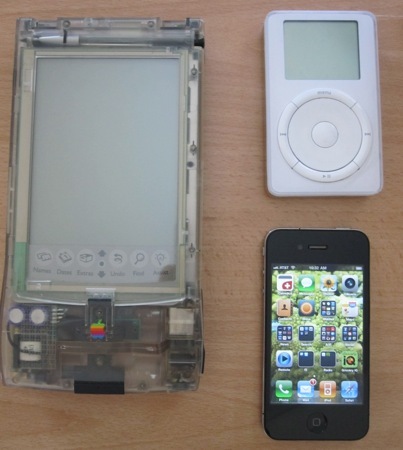 I remember a conversation in which I pulled a cell phone, an iPod, and a Palm Pilot out of my pockets and lined them up on a table. “The day that someone comes up with a single device that combines the capabilities and ease of use of all three of these devices is the day you will find me standing in line to buy one” I declared. That would be the iPhone, a slab of black glass that has more computing power than the entire operations center Dad worked at three decades earlier. I have a closet full of Macs that I can’t bear to get rid of: my trusty old Iici, the 7100, the blue iBook – and they all still work. My web design work requires me to have a PC for browser testing, and I’ve lost count of how many I’ve had to throw away due to fundamental failures of circuit boards or connectors. You may pay a premium for a Mac, but it is guaranteed to outlive any PC by a wide margin. There are active web servers out there running on 128K Macs. I have been a member for 25 years of an email list server that is still running on an first-generation iMac equipped with Claris Emailer and Hypercard. 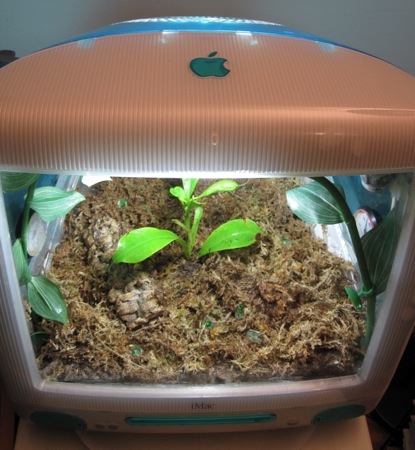 Next to the machine on which I’m writing this is a terrarium retrofitted into an iMac shell. I owe my second career, the one I’m happy with, to Steve jobs. Years of working with machines that got out of the way of creativity opened my eyes to clean design, usability, and elegance – factors I strive to incorporate into my own work. 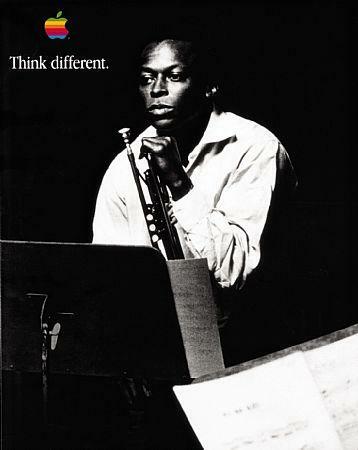 I never knew the man, but I’ll mis him just the same. This entry was posted in culture, design, influences and tagged culture, design, influences. Bookmark the permalink. Just to let you know, wait until you see the pictures of the new iTerraria I’m working on. I’m currently working with improvements on the sealing AND on painting the polycarbonate, and found some great colors for the latter. I think the world needs a black iTerrarium with racing flames coming from the vents; don’t you? If Alton Brown cold do it with a KitchenAid mixer, you should be ale to add flames to an iTerrarium. Oh, it’s even easier than I thought. It’s not quite as cool as the one with a shell in tiger beetle iridescence, but it’ll do. That I’d like to see.